TAMPA, Fla. -- For storm experts like Jennifer Collins, what happens between hurricane seasons is just as important as the seasons themselves in predicting and understanding hurricane activity. “There is always something to learn,” she said. Like the fact that hurricane activity in the Northeast Pacific and the North Atlantic are interconnected. Collins, assistant professor in the Department of Geography, Environment and Planning, made the discovery only after dividing the Northeast Pacific into two distinct sub-regions -- east and west. But it’s a complex relationship; one that is closely tied to the El Niño phenomenon, sea surface temperatures and winds, among other environmental factors. Collins also noted the role that relative humidity in the mid-atmosphere played on hurricane development in the western sub-region of the Northeast Pacific. An active season in the western sub-region of the Northeast Pacific, Collins found, typically means a less active season in the North Atlantic. The same is true in reverse. Collins’ ground-breaking work, published in the Spring 2010 edition of Southeastern Geographer, could have implications for predicting future storms. So, too, could her analyses of prior hurricane seasons, like the 2009 North Atlantic hurricane season that was below normal in terms of overall hurricane activity. This work was published in the December 2010 issue of the National Weather Digest, with her work on the 2009 Northeast Pacific hurricane season currently in press in the American Meteorological Society journal, Monthly Weather Review. Long fascinated by hurricanes and other big storms, the London-born Collins joined USF in 2005 after stints at universities in New Hampshire and Pennsylvania and having earned her Ph.D. from University College London. 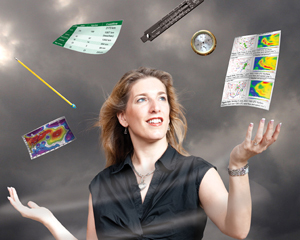 Today she oversees the USF Weather Center, a laboratory where teaching and research is focused on climate and weather conditions ranging from hurricanes, tornadoes and rip currents to global warming and the social aspects of major weather events. The development of a new integrated ocean-atmosphere modeling system to provide better tracking of weather systems -- a joint project with USF’s College of Marine Science and Florida State University. A new warning system that links weather warnings with demographic and infrastructure data. Advancing knowledge about the impact of El Niño / Southern Oscillation (ENSO) Neutral conditions (the phase between El Niño and La Niña) on predicting Atlantic hurricane activity. Understanding what causes year-to-year variation in hurricane activity. Working with Robin Ersing, USF associate professor of social work to understand how people get their information during a hurricane evacuation and how they make the decision to stay or go. As Collins and her students look ahead to the 2011 hurricane season, they also look back. View the full list of USF faculty hurricane experts.